There’s more to generating online sales leads than meets the eye — even the eye of an experienced marketing professional. The Internet Marketing Lead Generation Ecosystem infographic was created by Straight North to help online marketers visualize all of the potential elements of an online campaign, and perhaps more important, how these elements must be connected to achieve results and facilitate rapid and dynamic continuous improvement. Those engaged in product marketing may find it beneficial to ponder the biggest element of the infographic, the COMPANY WEBSITE hexagon. The company website makes or breaks any lead generation marketing campaign (e.g., SEO, PPC, email, social media, retargeting). Once visitors click on an organic link, an ad, a social media share, etc., they come to the website and either convert via form or phone, or drift away — it’s as simple as that. 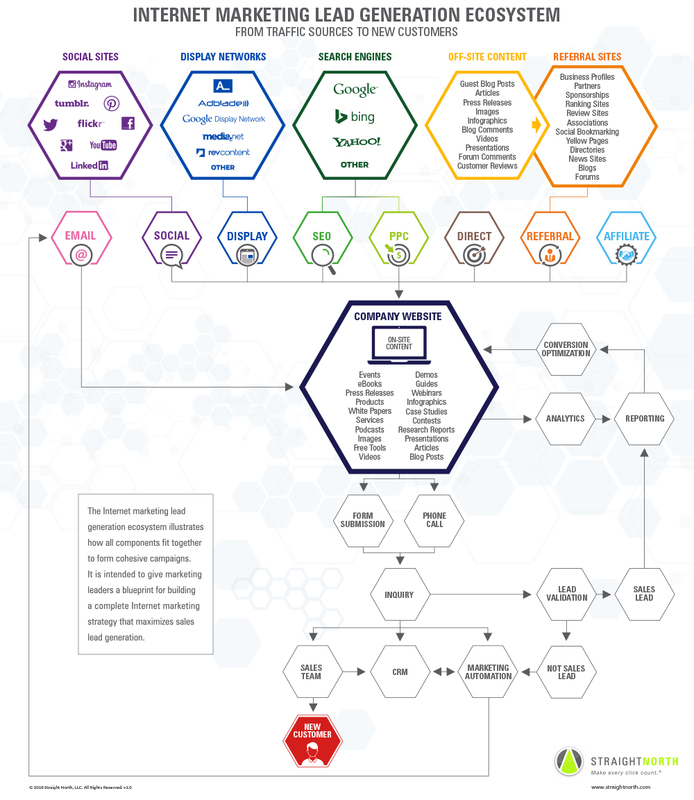 Another element of the infographic worth noting is just below the COMPANY WEBSITE hexagon — a simple and unassuming hexagon labeled PHONE CALL. Are your online campaigns capturing phone lead data? If so, you are ahead of many of your competitors. Google Analytics and other standard website analytics packages do not provide much data on phone leads, and no qualitative insights; to know the marketing source of a phone lead and acquire qualitative insight, additional (and somewhat complex) functionality must be added to the website’s back end and incorporated into campaign structuring. Reviewing the infographic to spot campaign holes and weaknesses will enable you to effect meaningful and perhaps immediate improvements — or, better yet, confirm that your product marketing stands on a solid foundation. Either way, you have a lot to gain. With more than 25 years of sales and marketing experience, Brad Shorr is Director of Content Strategy at Straight North, a full service B2B internet marketing company that specializes in SEO, PPC and website design. Brad has written for and been featured in leading online sites including Forbes, Moz and the American Marketing Association.